Beginning in early April every year, beautifully colored flowers burst into bloom throughout Boston and fill the air with their sweet aromas and natural grace. Daffodils and crocus start the season off early, followed by tulips, azaleas, and blooming trees. Lilacs and peonies join the flower show soon, and roses arrive just as summer begins. No matter which of these blooms is your favorite, it's easy to find them if you know where to see spring flowers in Boston. From secret gardens to front yard beauties and slow walks in the park, discover a symphony of flowering plants every spring in Boston. Orderly French gardens dot the landscape of this beloved Boston park, which blooms with spring flowers like pansies and tulips throughout April and May. Tulips have grown in this charming, Victorian-era park since the mid-1800s, and today they number in the tens of thousands - over 20,000 in all! Wander the meandering paths through Insta-friendly flower scenes, and make a day of it with a ride around the willow tree-lined lake on a graceful swan boat - they arrive in mid-April every year. Our hotel's Back Bay neighborhood is one of the top places to see spring flowers in Boston because of its amazing collection of magnolia trees. The neighborhood's handsome townhouses have small front yards, but the owners make fantastic use of them with magnificent magnolia trees. You'll find magnolia blooms of almost every shape and size, including big saucer-size blooms and smaller star-shaped flowers. Colors vary too, from metallic pink to bright white and dark purple to brilliant magenta. 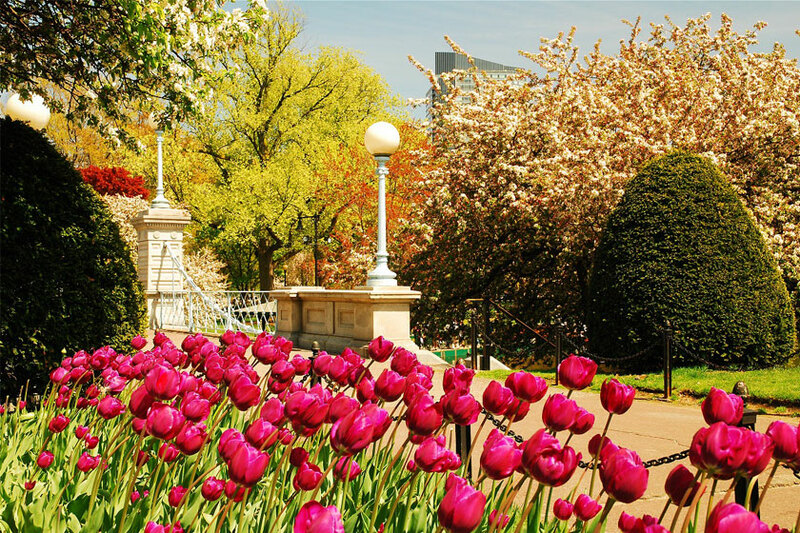 Go for a stroll along Beacon Street, Marlborough Street, and Commonwealth Avenue to see the stunning display every spring sometime around mid-April to mid-May. Daffodils, daylilies, tulips, peonies, and rhododendrons fill the springtime landscape of the Rose Kennedy Greenway & Memorial Garden. The Greenway is a true Boston treasure, with dancing water fountains, an old-fashioned carousel, food trucks and of course - spring flowers and blooming trees. Start in the Bamboo Garden in Chinatown, which becomes a riot of color and fragrance early in the season with rhododendrons and peonies. Later in the spring and early summer, the Rose Kennedy Memorial Garden offers a spectacular secret-gem oasis of roses in almost every color of the rainbow. Japan and Washington D.C. aren't the only two places where you can see the delicate pink blooms of cherry trees fill the air. Rows and rows of these enchanting trees line the banks of the Charles River, especially around the Back Bay and Fiedler Bridge. They bloom each year around mid-April, and although their flowers are fleeting - nothing feels more like springtime in Boston. In the three-mile-long park you'll also find docks, running paths, and three different playgrounds for the kids. April is prime time to visit this Harvard-managed garden, a large oasis of flowering trees in Jamaica Plain. Magnolia trees and lilac trees burst into bloom, filling the air with their heady scents and spectacular colors. It's ideal for a peaceful afternoon picnic, and you'll also find numerous trails and hidden pathways for hikes and longer strolls. Explore natural woodland areas and horticultural displays, plus ponds with wildlife and evergreen trees. And don't miss Lilac Sunday on Mother's Day every year, a festive celebration of the beautiful purple trees. For daffodil lovers and garden fans, this day trip is worth the drive. Located in Boylston, this picture-perfect garden is known for its bright yellow daffodils - over 25,000 of them bloom around the end of April and early May. Discover 17 different gardens spread across the 170-acre park, including walking trails and preserved woodlands. Explore the heirloom apple orchard and the beautiful moss steps. See wildlife around the pond and look for birds and butterflies. Stroll up the grand alley of Oak Trees and feel the awe-inspiring power of the natural world. The technicolor beauty of Boston's spring flowers is just a short stroll away when you stay at Revere Hotel. We're in the Back Bay neighborhood, just two blocks from Boston Public Garden - one of the best places to see spring flowers in Boston. Inspired by the city's rich history and uniquely rebellious character, our centrally located hotel puts you in the heart of the action. Relax in chic, comfortable rooms with balconies and enjoy seasonal New England cuisine. 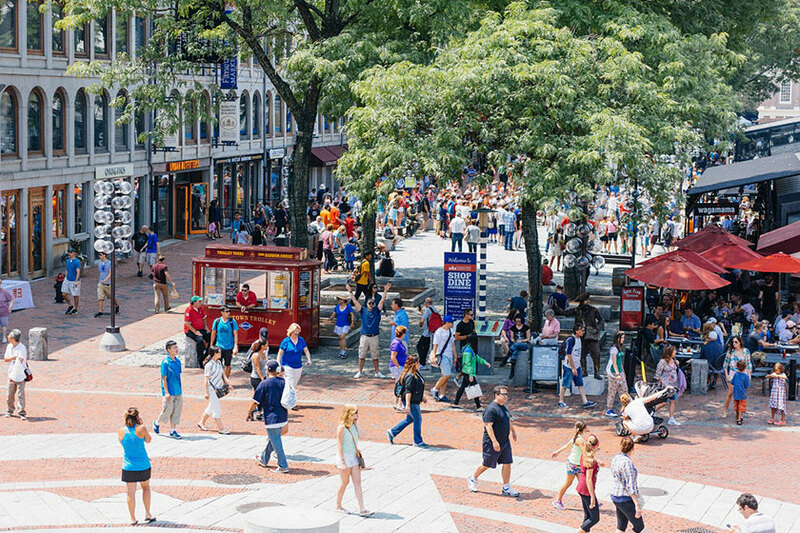 Walk to Downtown Boston's top attractions and enjoy easy access to public transportation. 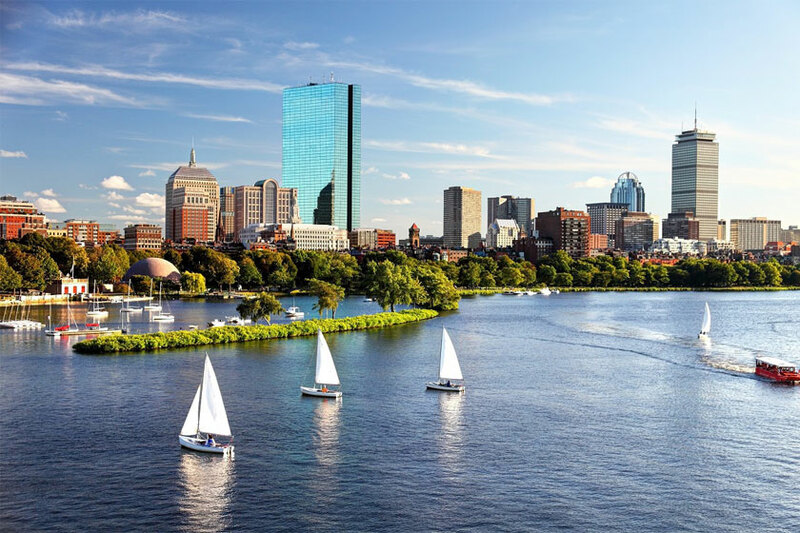 Immerse yourself in the buzzing energy of the city and forge a new connection with Boston this season with a spectacular springtime getaway.